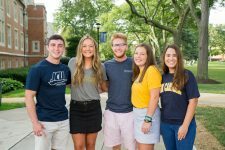 At JCU you can integrate your personal faith into the academic and social environment of the University. While the University welcome opportunities to bring a Catholic and Ignatian faith perspective to bear on issues and trends that may surface in various disciplines and social issues, we also celebrate the diversity of faith and spiritual perspectives that seeks both wisdom and a fuller spiritual life. No matter your faith background, you’ll be able to find a comfortable home within one of our Carroll Faith Communities (CFCs). These student-led groups of 6-12 students meet weekly in the residence halls to talk about faith and college life. There are a number of small faith communities, including Hillel (the Jewish community at Carroll), the Muslim Student Society, and the Orthodox Christian Fellowship. We hope you take the time to reflect, deepen your spirituality, and develop your personal belief system while at John Carroll. Grounded in the Jesuit Catholic Tradition, Campus Ministry serves persons of all faiths by inspiring a faith that does justice. There are so many ways you can engage in Campus Ministry activities—and it’s important to know that everyone—regardless of personal faith or belief—is invited to do so. Retreats at John Carroll are a popular way to reflect, relax, have fun, form new friendships, and strengthen your spirituality. These experiences may be a quick overnight gathering, or a weeklong getaway during a school break. Integral to a Jesuit Catholic education are immersion experiences which challenge students to engage the realities of the world while reflecting on the values of human dignity and servant leadership. Students travel to domestic and international locations where they are exposed to issues of poverty and injustice while experiencing unique cultures and environments. They engage in direct service activities, participate in experiential learning, and make educational site visits – while living in the very communities that they are serving.